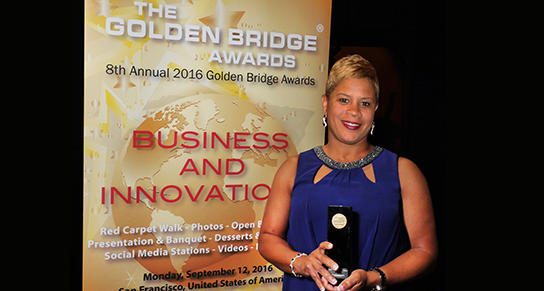 Vice President of Corporate Citizenship Shantrelle Johnson attended the 8th annual Golden Bridge Awards in San Francisco Sept. 12 on behalf of Nashville-based financial services company Advance Financial. Johnson accepted the Gold Winner award for the Corporate Social Responsibility Program of the Year. Advance Financial was honored for its corporate citizenship program, and the Advance Financial Foundation, which gave $203,755 in charitable contributions in 2015 to education and health and wellness organizations in Nashville and the other 34 cities throughout Tennessee where they have storefronts. Employees also logged a total of 1,557 community service hours in these cities. In the first half of 2016 the program gave $142,000 and volunteered nearly 1,000 hours. The Golden Bridge Awards are an annual industry and peers recognition program honoring the best companies in every major industry from large to small and new start-ups in North America, Europe, Middle East, Africa, Asia-Pacific and Latin America. Advance Financial, founded in 1996, is a family owned and operated financial center based in Nashville, Tenn. The company currently operates more than 70 locations throughout Tennessee and employs more than 600 local representatives. By focusing on a wide variety of financial services including wire transfer, bill payment, unlimited free money orders and FLEX loans they are committed to building long-lasting, strong relationships with every customer. Advance Financial was named to the Inc. 5000 list of the fastest-growing private companies in the country for the fifth year in a row.